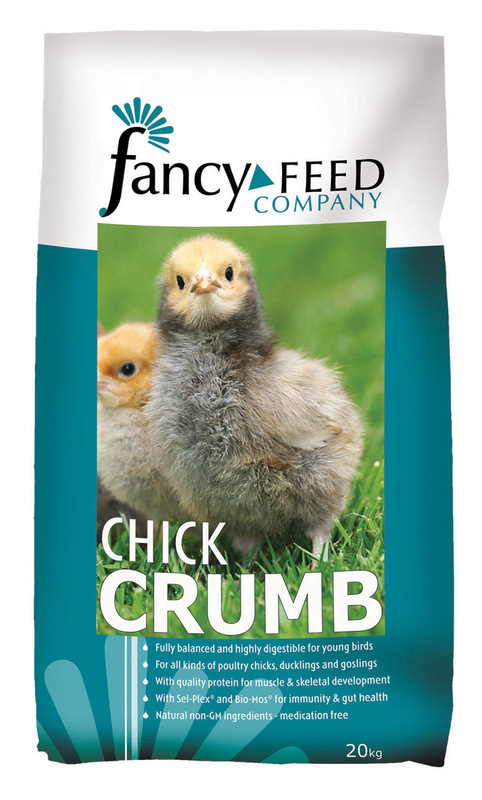 Fancy Feeds Chick Crumb is a balanced diet which has been uniquely formulated for all types of poultry chicks, ducklings and goslings. Provides essential nutrients for health and growth, protein for muscle and skeletal development and highly digestible wheat for energy to support growth. Fancy Feeds Chick Crumb is fully balanced with vitamins and minerals, with betaine to reduce dehydration risk, Sel-Plex selenium to support the antioxidant defence system and immunity, and Bio-Mos to optimise immune response and gut health. Wheat, Hipro Soya, Wheatfeed, Full Fat Soya, Grass Meal, Dicalcium Phosphate, Soya Oil, Vitamins and Minerals, Limestone, Bio-Mos®, Sel-Plex®. Protein 19%, Oil 4.0%, Fibre 4.0%, Ash 6.0%, Copper 25mg/kg, Methionine 0.4%, Vitamin A 12,000IU/kg, Vitamin D3 4,000IU/kg, Vitamin E 60IU/kg. There are currently no questions for Fancy Feeds Chick Crumb - be the first to ask one!